While we stand firmly behind the classic navy or grey, we’d encourage any guy to add a bold suit to their wardrobe. After all, the confidence that comes from a custom fit makes any garment much easier to wear. Wearing a white shirt and a solid tie is the most surefire way to bring a bold suit back down to earth. Indeed, we’d consider that the first step in wearing one. 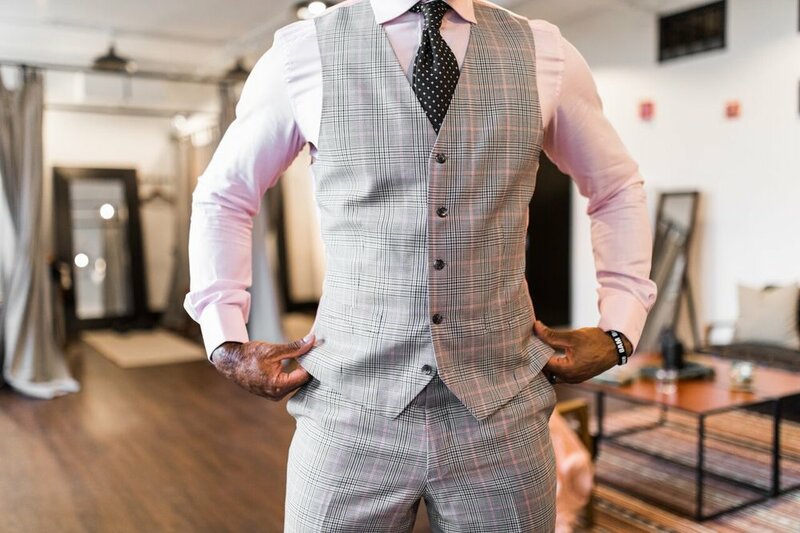 While that never-fails combo will serve you well, there are a few ways you can be more expressive in your shirt and neckwear approach while still maintaining a sense of balance with the suit. Keep the shirt solid, but branch out from the two most common shades by choosing something that’s still light and soft. Think lavender or lighter shades of green or pink. They’ll provide that extra pop of color while still fading into the background to allow your suit and tie to do the most talking. When it comes to pattern mixing, you want to clash. Imagine a plaid tie against a check suit: the effect might be a little dizzying to a spectator. Instead, pick a wholly different pattern, like stripes next to or houndstooth or polka dots against glen plaid. That way the eye can easily differentiate between them and see a complete look instead of a muddle.